Indulge in these protein-rich, Pop-Tart-style cakes when your next craving for something warm and sweet hits! We all indulge in the occasional cheat, and when that time comes, deciding on just one sugary treat can be tough. You might be craving the sweet, crisp taste of a toasted Pop-Tart or the moist, crumbly texture of a cookie. Rather than having to decide between the two—and down a bunch of sugar, fat, and refined carbs in the process—choose this healthy treat that combines the two guilty pleasures! These delicious, chunky, cakey bites of pow! are what happen when you cross a single-serving protein cake with your nostalgic childhood favorite. Enjoyed alongside—or dunked into—coffee, they make the perfect pre-workout snack. If you're looking to make these cakes even more Pop-Tart-esque, roll them out for a thinner, crunchier consistency. 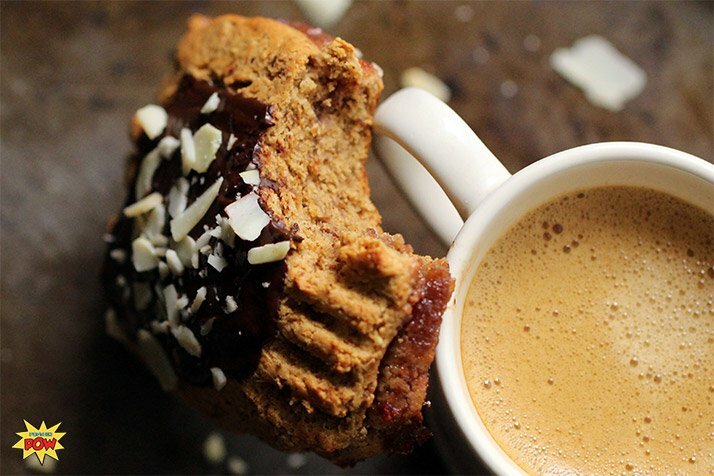 I'm just a sucker for dunking everything into my coffee, so my focus was on making my baked good ultra-absorbent—the more caffeine I can get per bite, the better. Please note that you have to use pea protein to make these; whey and casein won't do the job. Embrace pea protein and chow down on these goodies that provide twice the treat with none of the cheat!